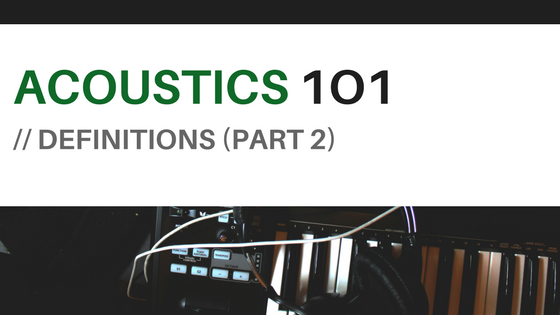 Acoustics 101- Definitions (Part 2) | Simoni Systems, Inc. The Time-Energy-Frequency (TEF) measurements and analysis is a technology that uses a swept sinewave test signal. The TEF device is controlled by a personal computer. The available domains in TEF measurements include energy-frequency, energy-time, frequency-time, and energy-frequency-time. Sound in an enclosure can be described as a diffused sound if the intensity of the sound energy is equal in any location of the room, or the sound energy flows equally in every direction. Many different factors can enhance the diffused sound. These include: geometrical irregularities, absent of focusing surfaces, absorptive and reflective elements randomly scattered throughout the space, and the existence of diffusing objects (furniture) or panels (diffusers). Diffusing panels scatter sound in defined directions depending on their type and the geometrical dimensions. The calculation of reverberation time using the Sabin equation assumes that the sound in the room be diffused. In practice, RT equations are good enough to describe the sound build up and attenuation in the room. In the case where the sound in the room is not diffused enough, such as rooms with good absorption surfaces in certain areas, or with an unusual shape (long and narrow, very low ceiling, or has many different focusing surfaces), the RT calculation is not accurate. There is Fitzroy equation to correct the RT calculation for rooms with good absorptive surfaces on certain axes of the room. The optimum reverberation time for different rooms depends on the volume of the space, the type of the room, and the frequency of the sound. In general terms, the optimum RT for rooms with speech programs is less then the optimum RT for rooms with music performance. The human hearing system has different sensitivities at different frequencies. This means that the perception of noise is not equal at all frequencies. Noise with significant measured levels (in dB) at high or low frequencies will not be as annoying as it would be when its energy is mainly in the middle frequencies. In other words, the measured noise levels in dB will not reflect the actual human perception about the loudness of a noise. A specific circuit is added to the sound level meter to correct its reading. This reading is the noise level in dBA. The letter A is added to indicate the correction that was made in the measurement. The transmission loss (TL) for a partition is defined as the difference in decibels between the sound intensities on two sides of the barrier. Sound transmission class (STC) is a single number used to characterize the air-borne isolation properties of a partition. The STC is determined from the TL measured at different frequencies. These measured values are then compared with a family of STC reference contours. Simple rules apply in choosing the appropriate contour. For example: STC for painted concrete block depends on its weight, but will be in the range of 45-48 for 8″, and of 47-51 for 12″. The STC of the composite structure (wall and window for example) is not the sum of the STC of its components. We have first to calculate the TL for the composite wall (taking into account the surface area of the components) then find the STC rating. Impact isolation class (IIC), like STC, is another single-number rating system for a solid-borne noise (floor-ceiling structure). The higher the IIC rating, the more efficient the construction will be in attenuating the impact sound within the frequency range of the IIC. For example: 6″ reinforced concrete slab (75 lb/sq ft) has IIC 34, and more then 54 when carpet with pad cover the floor.